A delicious new way to celebrate breakfast! We don't make Bee's Knees Granola on an assembly line. Every ingredient is carefully sourced, skilfully mixed and lovingly baked at home. Some say the organic apple syrup from our own orchard makes the difference. Or is it the array of other exotic fruit? Or the healthy seeds? We have our own ideas. But we would love to know what YOU think. 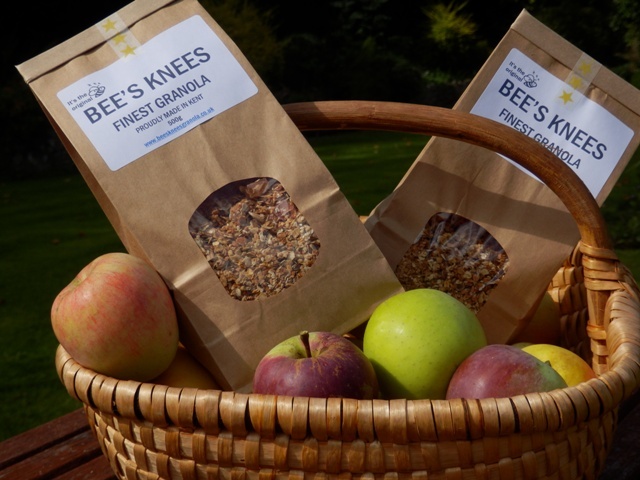 Bee's Knees Granola is created in the picturesque Kentish village of Little Chart where H E Bates wrote the "Darling Buds of May". We proudly supply - winners of the 2015 BBC Food and Farming Awards in the category "Best New Food Initiative"